In an ever evolving smartphone world, BlackBerry, formerly known as RIM, has unveiled their latest offerings, which includes the Z10 and the Q10. The latter of the two keeps the traditional BlackBerry design, featuring a full, physical QWERTY keyboard and a 3.1-inch touch screen. Full specs of the Q10 are unknown at this time, as is its price and release date. The Z10, on the other hand, is what BlackBerry kept their focus on. It boasts a 4.2-inch 1280×768 display, an 8MP rear-facing camera, 4G LTE support, a microSD card slot, 2GB of RAM, 16GB of internal storage, and dual-core processor at 1.5GHz, and lastly, a 2MP front-facing camera. Both devices run BlackBerry 10 (or OS 10, if you will), which offers a number of unique (but sometimes confusing) gestures that can make taking care of tasks very quick and easy. Pricing and availability for the Z10 varies by country and carrier. In the UK, the phone is will be available as early as tomorrow, while in Canada, it will be available at the end of next week. For the United States, however, we won’t be seeing retail availability until sometime in March with prices around the $200 mark. For more information about BlackBerry’s latest offerings, you’ll find the press release below. Waterloo, ON – BlackBerry® (NASDAQ: RIMM; TSX: RIM) today launched BlackBerry® 10, the re-designed, re-engineered, and re-invented BlackBerry platform that creates a new and unique mobile computing experience. Available on two new LTE-enabled smartphones, the BlackBerry® Z10 (all-touch) and BlackBerry® Q10 (touch with physical keyboard) smartphones powered by BlackBerry 10 offer you a faster, smarter and smoother experience than any other BlackBerry you have used before. BlackBerry unveiled the new BlackBerry Z10 and BlackBerry Q10 smartphones at events held simultaneously in New York, Toronto, London, Paris, Dubai, and Johannesburg. The ever present BlackBerry® Hub, which is a single place to manage all your conversations whether personal or work email, BBM™ messages, social media updates or notifications, and the ability to “peek” into the BlackBerry Hub from anywhere, so you’re always only one swipe away from what matters to you. BlackBerry® Flow, where the BlackBerry 10 experience excels by enabling features and apps to flow seamlessly together, helping you complete the task at hand effortlessly and efficiently. For example, you can tap on an attendee listed for a meeting to see their latest tweet or LinkedIn profile. Or tap the thumbnail of a picture you just took to launch the Picture editor and quickly apply a transformation or filter, then instantly share it with your contacts. BBM (BlackBerry® Messenger), which allows you to share things with the people that matter to you in an instant. BBM in BlackBerry 10 includes voice calling and video chat, and introduces the ability to share your screen with another BlackBerry 10 contact. BlackBerry® Balance™ technology, which elegantly separates and secures work applications and data from personal content on BlackBerry devices. Time Shift, an astonishing camera feature that lets you capture a group shot where everyone is smiling with their eyes wide open. Story Maker, which lets you bring a collection of photos and videos together, along with music and effects, to produce an HD movie that you can instantly share. BlackBerry® Remember, which combines memos, tasks and much more into a single experience. It helps you organize and manage information you have on your smartphone around projects or ideas, letting you collect content such as websites, emails, photos, documents, and other files, and then like a To-Do list, lets you create tasks, assign due dates, and track your progress. If your BlackBerry 10 smartphone is set up with a work account, your Microsoft® Outlook® Tasks will automatically be wirelessly synced with BlackBerry Remember. If you have configured an Evernote account with your smartphone, BlackBerry Remember will sync Evernote workbooks as well. BlackBerry® Safeguard technology that helps protect what is important to you, and the business you work for. Built-in support for Microsoft Exchange ActiveSync® so your BlackBerry Z10 or BlackBerry Q10 smartphone can be simply connected and managed as other ActiveSync devices in a company, or enabled with BlackBerry® Enterprise Service 10 to gain secure access to work email, “behind the firewall” applications and data, and benefit from other security and enterprise mobility management features. The BlackBerry® World™ storefront, which now includes 70,000 BlackBerry 10 apps and one of the most robust music and video catalogs in mobile today – with most movies coming to the store the same day they are released on DVD. In addition, Facebook, Twitter, LinkedIn and Foursquare apps for BlackBerry 10 are preinstalled, and BlackBerry 10 customers will have access to leading applications from across the globe. Leading application providers including Disney, Cisco, Foursquare, Skype and Rovio have committed to the platform. In the UK, the BlackBerry Z10 will be available beginning tomorrow on pay monthly contracts and pre-pay plans from EE, O2, Vodafone, Phones 4u, BT, 3UK and the Carphone Warehouse. 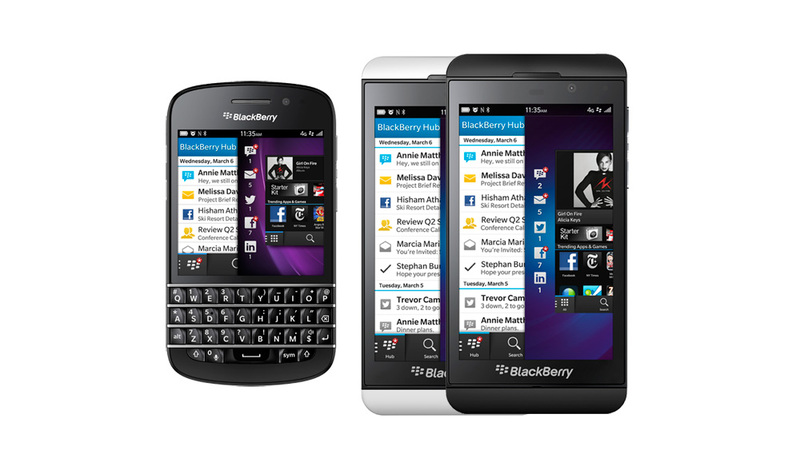 BlackBerry Z10 smartphones will be available fully subsidized on competitive monthly pay contracts. Price points will vary according to carriers and retail partners. Many of our global partners have already launched or will be launching pre-registration and pre-order sites today.